1. Wellington B Mk IA.Unit/Location: 9 Sqn, Honington/Great Britain, 18.12.1939. Code: Grey WS-B / Black N2873. Duty: Bomber. Pilot: Frank Pett. 2. Wellington B Mk IC.Unit/Location: 75. Sqn, Feltwell/Great Britain, January 1941. Code: Grey AA-Y / Black R1162. Duty: Night bomber. Pilots: Charlie Pownall and Oliver Matheson. 3. 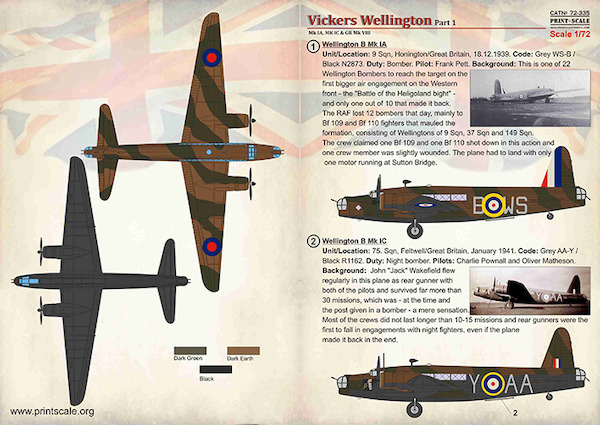 Wellington B Mk IC. Unit/Location: 99. Sqn, Newmarket/Great Britain, 04./05.12.1940. Code: Grey LN-F / Grey T2501. Duty: Night bomber. Pilot: F H Vivian. 4. Wellington GR Mk VIII. Unit/Location: 221. Sqn, Luqa/Malta, Summer/Autumn 1943. Code: Red X / Red HX604. Duty: Submarine hunter and anti-shipping duties. 5. Wellington B Mk IC. Unit/Location: 218. Sqn., Marham/Great Britain, Summer 1941. Code: Grey HA-L / Red R1448. Duty: Night bomber.